With beautiful seafront views and an excellent restaurant, Monkey Island makes for a great home base on Koh Rong. 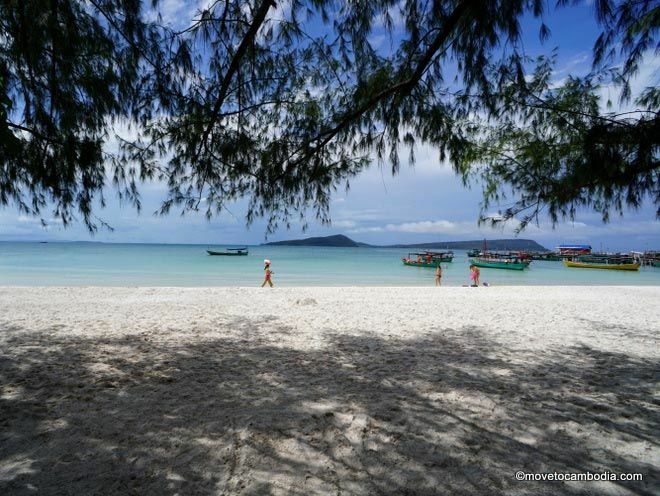 Popular with backpackers and flashpackers alike, Monkey Island is a firm Koh Rong favorite. The bungalows are simple but nice. The beach in front of Monkey is stunning, with white sand and calm, turquoise waters, and they’ve got a big stretch of it. There are hammocks hung between some of the trees that are an ideal place to read a book or just woolgather. They also make an effort to clean the beach and keep everything in their area tidy, which is a far cry from the indifference exhibited by most accommodations in the village. Go out and soak up some rays, or enjoy the Monkey Island beach under the shade of a tree. The bungalows are in the process of being renovated one by one, so some are nicer than others at the time of writing. 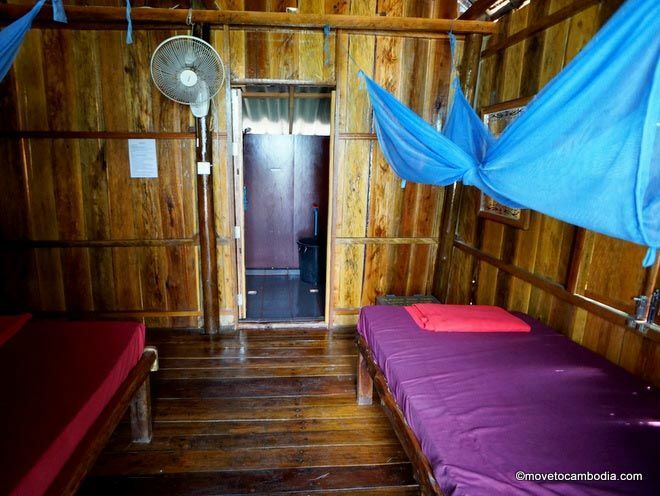 All have 24-hour electricity (not a given on the island), with mosquito nets, cool-water showers, and electric fans. Each has a private balcony with hammock and table and chairs, a great place to lounge and soak up the sea views. On our last visit, we hardly left our hammock for days on end. 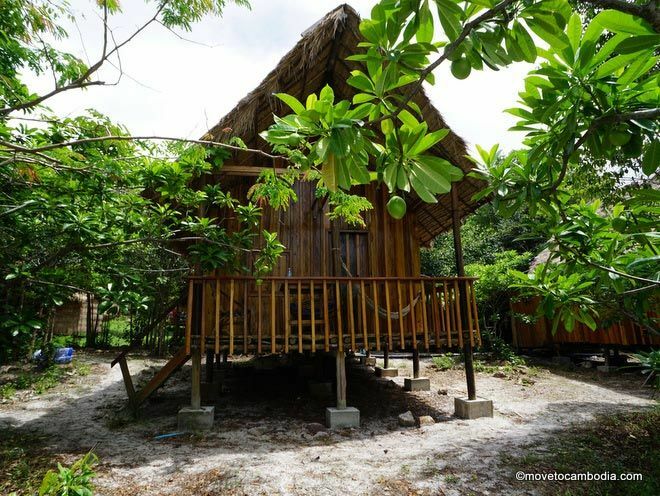 Made from treated wood, the bungalows have locally made thatched roofs and walls with windows that are locked using a piece of wood. There have been a lot of thefts on the island in the past, so now every bungalow has a wooden security box for your valuables. Bring your own lock, or buy a new one from them for $3. Bungalows have hammocks and chairs outside, and each has a fire extinguisher inside, which is a welcome amenity on an island that has had several devastating fires. Monkey Island bungalows are simple, with lovely views, and offer good value for money. Each bungalow has been designed to hold the maximum number of people possible; our group of three stayed in two bungalows, and each bungalow had three beds, presumably so backpackers can bunk together to save money. The seaview bungalows have one single bed and a double bed, and the bungalows that are a bit further back from the beach have two double beds and one single bed. They also have an air-conditioned mixed dorm, and a women’s dorm is in the works. At $5 to $7.50 per bed Monkey Island is very affordable and offers one of the only air-conditioned options on Koh Toch Beach. The interior of one of the Money Island beachfront bungalows, taken in June, 2016. 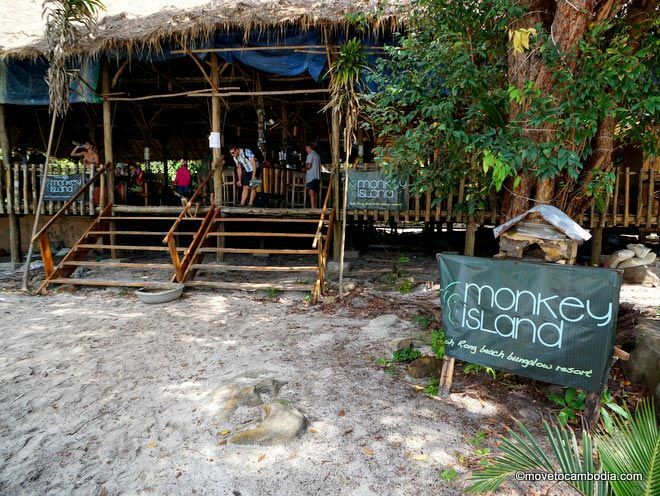 The island extension of Sihanoukville’s popular Monkey Republic guesthouse and bar, Monkey Island is probably the most fun place to stay on Koh Rong. The large restaurant area is constantly filled with people and music — what kind of music depends on the mood of the bartender and can be anything from hip hop to Britpop. Happy hour lasts from 4 to 8 p.m., during which time cocktails, which are already reasonably priced at $3 or $3.50, are offered two-for-one, and draft beers are $0.75, plus they sell delicious local Kampot cider for $2. If you’re looking to meet other people and hang out, but don’t want to stay in the village proper, Monkey is the place to go. The food at Monkey Island is also worth trying — particularly the Thai curries. Prices are low (around $3.50) and portions are enormous. They also have good, inexpensive Western fare priced the same as on the mainland. Service can be a bit a bit spotty, so order drinks first and have some patience when it’s crowded. There’s a very good WiFi connection (reported to be the fastest on the island) in the restaurant if you need to get online. Hang out and meet other travelers at the Monkey Island bar and restaurant. 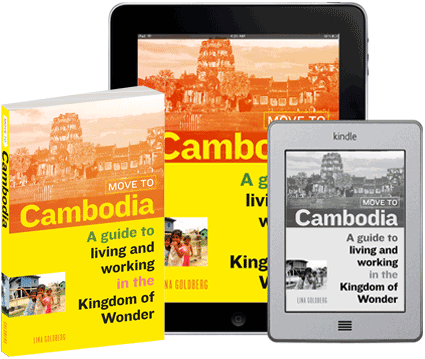 Walk-in rates are the same as what you’ll find online, and at their booking office at Monkey Republic in Sihanoukville. 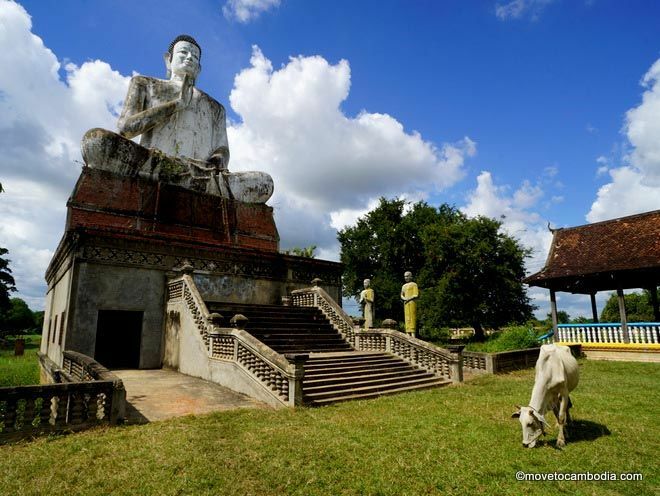 Check prices at Monkey Island on Booking.com or Hostelworld.